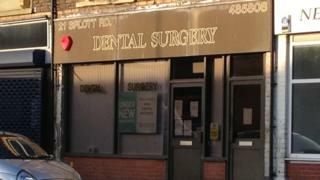 A Cardiff dentist who breached "basic and fundamental standards of care and hygiene" has been struck off. Mark Roberts ran the Splott Road Dental Surgery until 2014 and left in 2015. Following his departure, health officials contacted 3,000 patients to offer precautionary blood tests. On Monday, the General Dental Council (GDC) found more than 20 examples of failings including reusing single-use equipment, not cleaning instruments and not disposing of waste properly. Mr Roberts did not attend the hearing but the GDC found his fitness to practise was impaired and struck Mr Roberts off "for the protection of the public". The GDC's professional conduct committee heard evidence from dental nurses who reported that Mr Roberts' everyday practice was poor. There was also photographic evidence of the drawers where Mr Roberts kept the tools and equipment he used for treating patients every day. These showed visibly soiled equipment placed in dirty drawers. The committee found "a wide ranging list of serious clinical failings over a protracted period of time" and said Mr Roberts "failed in his duty as a dental practitioner to provide the basic standard of care to his patients". Its report added: "The dental records demonstrated a high level of supervised neglect by Mr Roberts and a blatant disregard for the standards of the profession. "Given the serious and wide-ranging failings found, the ongoing risk to the public and the need to safeguard public confidence in the dental profession, the committee was of the view that an immediate order of suspension is necessary for the protection of the public and otherwise."